I have to say that was the most relaxing holiday break we’ve had in a long time. I only worked half days the week leading up to Christmas, so I had plenty of time to get the house clean and get us packed up for Christmas in Spartanburg, SC. It was so nice not to feel stressed and rushed walking out the door, although somehow I was still trying to gather and wrap presents right before we left. Speaking of things I didn’t get done this year, we didn’t really decorate for Christmas, and somehow I didn’t mind too much. I have really been feeling the need to declutter, and the idea of putting decorations all over the house didn’t thrill me. So we cut down our tree, put on lights, and left it alone! As Christmas cards came in, I did put them in the tree with clothes pins, but that was all we had on the tree. It was refreshing. 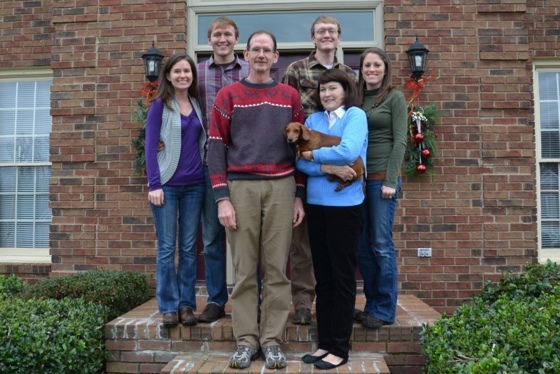 We enjoyed spending Christmas with Matt’s family in SC. 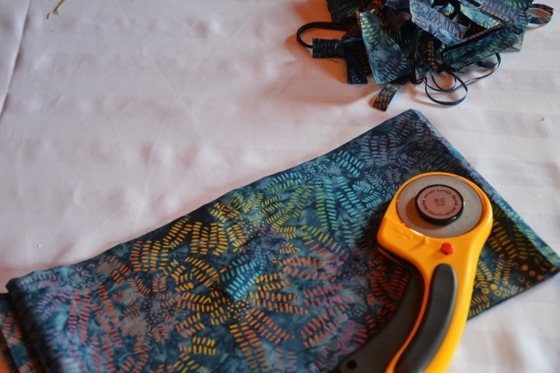 His mom helped me sew some pajama pants that I was trying to give to my mom and sisters. I often feel like the world’s worst sewer, but I can only get better with practice, right? 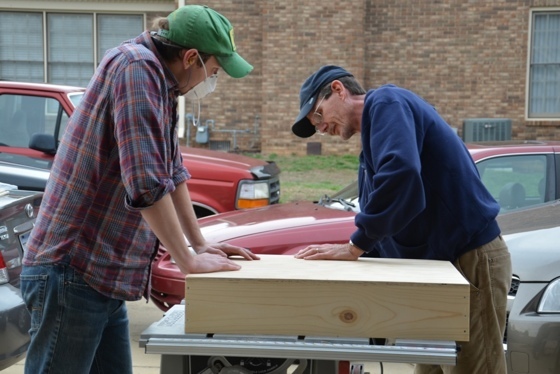 Matt’s dad helped him build a light box for a screen printing press he is setting up. 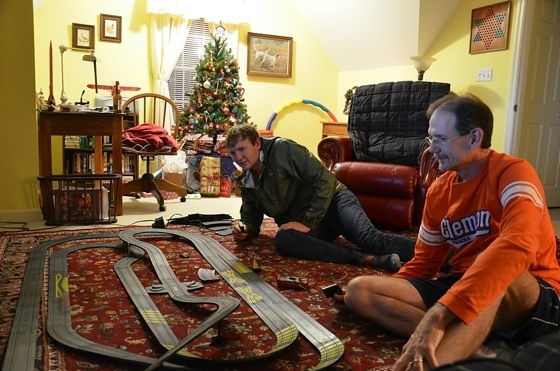 They also spent lots of time racing cars! 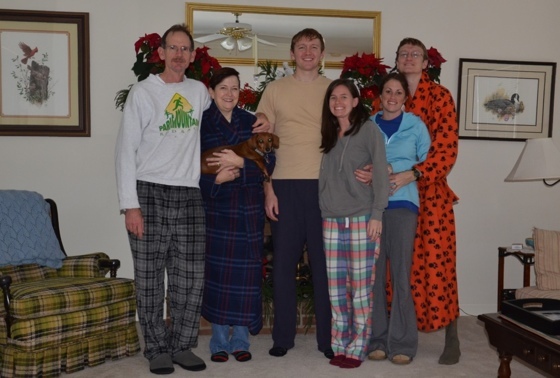 As soon as we got home from the Christmas Eve service, we changed into our pjs, ate our Christmas dinner and played games. Here is the whole family! It was a nice week – we stayed up late, slept in, ate great food, and had a lovely time with family. After a nice, long Christmas break, we came back to Boone for a few days. I only worked half a day, so once again, I had plenty of time to get us ready for our trip to Greensboro, NC to ring in the new year with my family. We enjoyed spending a few days with my sister before she went back to Thailand! 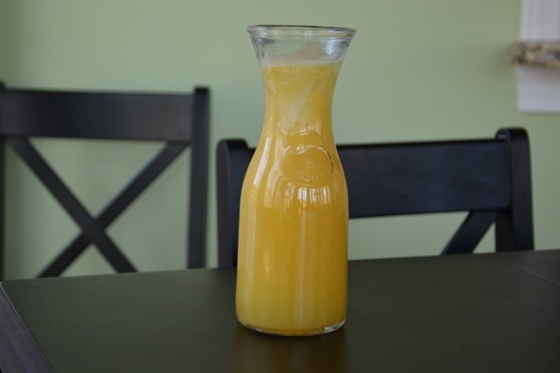 I got a food processor from my parents, and it had a juicing attachment, so of course I made lots of juice! I helped my mom cut out some strips for a quilt she is working on. 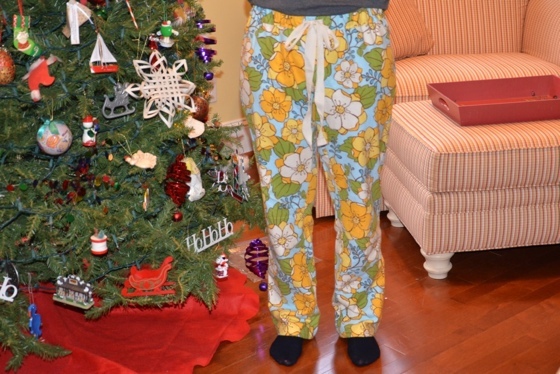 I didn’t finish all of the pajama pants I was trying to make, but I did finish my mom’s, and they fit great. I’m encouraged to keep working on the other pairs! We also spent time with some relatives in Charlotte, did some shopping, and played lots of Settlers of Catan. We came back to Boone yesterday and now have an entire day to unpack and get settled into the house before we have to work tomorrow. It has been glorious to come back rested with time to get ready for the week! This entry was posted in Family, Holiday by Ashley. Bookmark the permalink. So glad you could have a restful holiday!! I got a sewing machine for Christmas so I might steal your worst sewer title. Baby steps, right?